Redwood are no longer trading. For a list of alternative brokers, and full comparison reviews, visit our brokers page. Opening an account is very simple and super quick. All you need to do is to go to their home page and fill out your info. Once you finished the quick form you will transfer automatically to fund your account and start trading. Redwood options offer 3 types of investments accounts all with personal assistance and special, personal strategy training. Red wood options is a spot option web based platform and as such is highly reliable and easily accessible from anywhere in the world. Redwood offers several option contracts and different markets for both experienced and novice traders to capitalize on; Mainstream call/put options ranging from 15 minutes through daily, weekly and monthly options. Extreme touch options with potential returns of up to 550%! Super fast super profitable 60 seconds contracts as well as a custom contracts builder. Over 100 underline assets- over 10 currency pairs! Returns of up to 85%! Very high exposure limit- up to $5,000 with no limit on number of positions. Most competitive bonus offers in the industry. Traders can open accounts in Euros, British Pounds, US Dollars, CAD and AUD. You can fund your account using any major credit card in addition to wire and cashU options. Redwood options offer 24/5 support via live chat, mail and toll free phone numbers. Their customer support personal are very kind and would be able to also forward your address to different departments in the company. At the moment redwood options only supports English speakers. 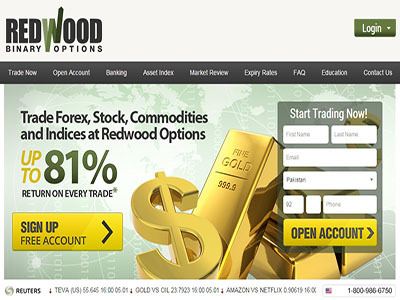 Redwood Options is among the newest entrants in the binary options trading industry. They make use of the SpotOption trading platform that is extremely popular in the industry and is being used by top brokerages such as TradeRush. They offer an attractive payout of about 80% on your investments and provide excellent bonuses to help you take advantage of high payouts from binary options. They provide excellent educational services to all the traders, so that the latter can make sound trading decisions. Redwood Options also offers excellent withdrawal schemes. They do not charge for withdrawals via credit cards while also providing payment gateways to ensure safe transactions on the platform. Redwood Options is a young and vibrant company that’s already making waves in the industry with their special bonus offers and training strategies. We should see great things from these guys in the near future.